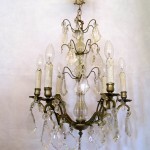 As specialists in antique lighting, we offer a beautiful and diverse collection. We also design and make bespoke light fittings. A family run business, with over 30 years experience in period lighting, we manufacture, restore and design lights and can offer a bespoke service to undertake individual commissions to suit our customers’ requirements.We have supplied antique and bespoke lighting to both film and TV companies and work closely with interior designers and architects, supplying lights for bars, clubs, restaurants and hotels throughout the UK and Europe. Our showroom is based within the beautiful and historic surroundings of Harrow on the Hill. 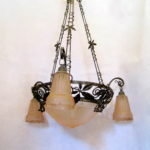 We have been collecting antique lights for almost forty years. We travel the globe for the best antiques and collectible lights from 1860's to 1960's including crystal chandeliers, oil lamps, Arts & crafts, Art nouveau, Art deco through to the Retro period. We restore all of our antique lights and rewire to the highest standards for whichever country it will go to. 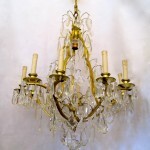 In addition, we also convert items into lights and repair customer lights to their original splendour. We have a large number of accessories such as original shades, crystal arms, crystal drops, crystal pans, galleries, ceiling roses etc.